German composer Philipp Scharwenka wrote these three late romantic works for violin and piano around 1900. Philipp Scharwenka’s music is less well-known than that of his younger brother Xaver, a well-known pianist and teacher. Xaver produced lush, dramatic, high-calorie, virtuoso confections. If Xaver is the joking, back-slapping brother, Philipp is the serious, high-minded sibling, at least on the evidence of these three pieces. All are in minor keys. They are rather conservative, and perhaps represent establishment musical culture of Wilhelmine Berlin. The opening B Minor Sonata, Op. 110 may be my favourite. It begins urgently, with a touch of menace, somewhat akin to the world of Schubert’s song, Der Zwerg. A tiny Largamente continues the unsettling mood, which is resolved by a triple-time finale. This movement begins quietly, but swings nicely by the end. The E Minor Sonata, Op. 114 is more elegant. There is rising tension throughout the opening Allegro moderato, which ends cleverly. An Andante tranquillo provides a gentle interlude before the smoldering passion of a finale which ends with unexpected quiet. The Suite, Op. 99, the earliest of these three works, is organized as a suite of dance movements. Most striking is a forceful Toccata. My attention wandered a bit during the Ballade, only to be restored by the Intermezzo, a perky double-time dance. The concluding Tarentella is the most playful movement on the disc. I am not sure why Philipp Scharwenka’s music fell from favour, but note that these aesthetically cautious works remained in the Brahms-Grieg line of violin sonatas at a time when other composers were attempting innovations, such as Busoni’s Violin Sonata No. 2, a bolder work from the same era in Berlin. World War I; the composer’s death, and the march of modernism probably did the rest. But these melodic, carefully constructed works are well worth a listen. The wonderful musicianship of Natalia Prishepenko and Oliver Triendl makes this interesting disc even more worth-while. Prishepenko, a Russian violinist based in Germany, is a veteran of the Artemis Quartet. Triendl, who has made many compelling recordings of non-canonic composers of the late Nineteenth Century, matches Preshepenko’s energy and musical intelligence. Excellent sound shows off both musicians quite well, and it is difficult to imagine a better case being made for Philipp Scharwenka. 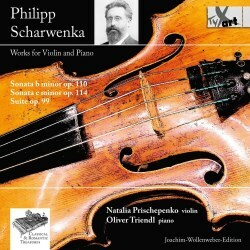 Listening to this disc made me curious to listen to some of Philipp Scharwenka’s orchestral pieces, which disappointed. There is not much available, but perhaps his strength was chamber music. It also led me to listen again to his younger brother’s piano concertos. They are big, sprawling, well-upholstered things, packing many more thrills than Philipp’s more proper chamber music. If you have a musical sweet tooth and do not know these pieces, check out Hyperion’s excellent performances of all four of Xaver’s piano concertos.